Philosophical Gourmet Report Advisory Board: If Not Now, When? Three weeks ago I posted “An Open Letter to the Advisory Board of the Philosophical Gourmet Report.” I provided detailed information about the continuing ties between Leiter and the PGR, including legal ones. No one on the Board has publicly answered any of the questions raised in the letter. Leiter’s blog continues to derive legitimacy from its connection to the PGR. And he continues to behave badly in relation to other members of the profession. 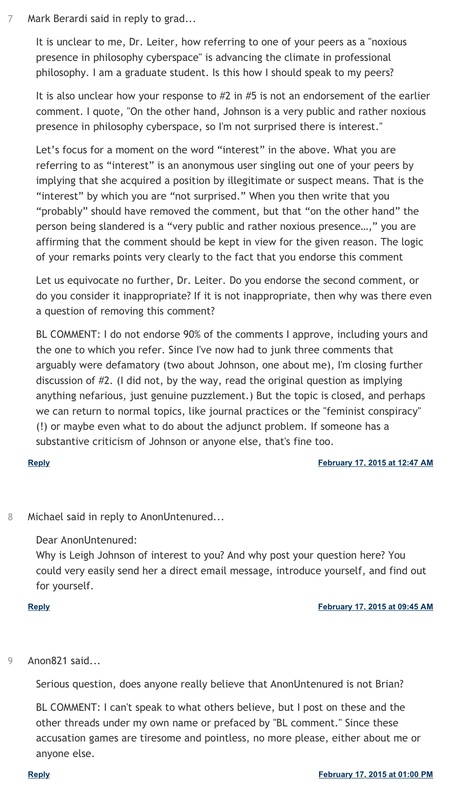 Yesterday afternoon he posted an anonymous comment on one of his “Open Threads” about Professor Leigh Johnson, an untenured member of the profession. When questioned as to why he allowed a comment against an individual, since he was moderating the thread, he brushed the question off: Well, I suppose I shouldn’t have, but I did, so it stays. Leiter claimed that nothing defamatory had been posted, after referring to Professor Johnson as a “rather noxious presence in philosophy cyberspace.” Leiter’s excuse–that what is being said is not technically, legally, defamatory–is not the bar for reasonable behavior in our profession. Even his supporters on this thread are balking at the anonymous attack on Professor Johnson. This must stop. I once again call on the Advisory Board to address this issue. Break the ties between the PGR and Leiter’s blog. If you are unwilling or unable to do so, then you should resign. Please don’t say, we can’t stop Leiter’s bad behavior, because you certainly can help to delegitimize it, which will go a long way to solving the problem. Leiter should not be given the cover that you provide him. It is simply wrong to lend your names to this. Here is the exchange from yesterday, February 16, 2015. UPDATE, 4:15 PM, February 17th. 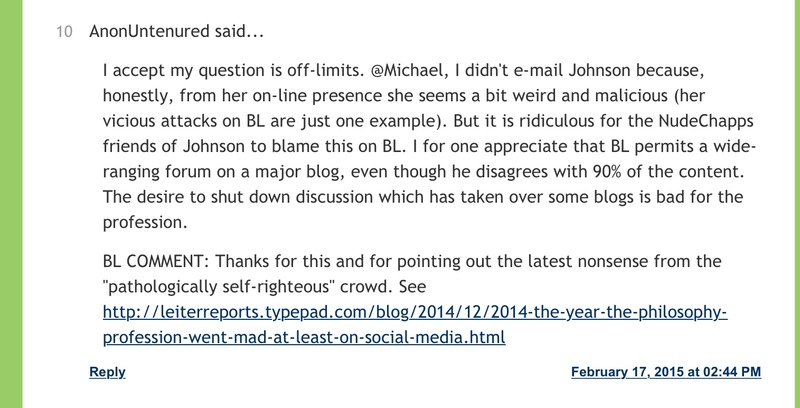 The comment below and Leiter’s response were added to the thread after I posted at around 3:00 PM. The Board truly needs to act. How many members of the PGR Advisory Board do you think are even aware of the existence of your open letter to them? I asked the one I know whether he had received the letter or was made aware of it in some other way. He had no idea what I was asking about. Thanks. I don’t have any numbers. My impression is that there are at least a few who know, but your point is well taken. I am in the process of deciding about the best way to make sure that they all know. Might just send it to all of them or perhaps those who took the lead in the fall.